This section will document all the David Byron interview segments we can find. Either in mp3 audio format, embed video links or written quotes from magazines and articles. Below is a nice start and other sources will also be added for related topics concerning David and his vast musical career so this section is far from finished. 24:33 long in 8 kbs mp3 format. File size: 1.40mb. 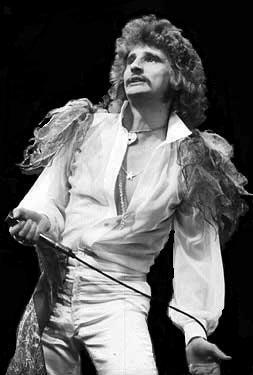 Personal interview with David Byron in 1979. 13:07 long in 8 kbs mp3 format. File size: 763 kb. The videos embedded below feature the entire band but David adds some nice comments during each. All these files are hosted on Youtube and this website has no control over comments or content. Uriah Heep interview from the 1972 Bijou Theater video material. Some nice comments from David. Uriah Heep interview from Sweet Freedom promos in 1973. David making light of the new material. Uriah Heep interview on the Wonderworld release in 1974. Nice opening comments. "There are very few bands in the world who could follow us when we're on. The first few days of the tour you spend blowing out the cobwebs, ya' know, changing the lineup every night 'cause you're on a different time schedule. But as long as the audience is prepared to accept us for what we are, we'll play the most fantastic music in the world. My confidence onstage these days amazes me, I feel almost as if I could stand on my head." "I started singing 22 years ago at the age of 5. My mother was singing in a Jazz band, my whole family was into music. Everybody played a instrument or was tap dancing. Around that time I tried to get famous by a children's TV show. My first band had no name, did no gig's and lasted exactly 2 weeks. When I was 16 a local band offered me a job. I did one gig with them and joined the band of Mick Box which then was called The Stalkers. They had fired their vocalist and at the audition I had to sing Johnny B. Goode. I was hired right away." "So Tired I wrote pretty well on my own. I got the chords together on my piano at home. The lyrics are kind of tongue in cheek, you know, kind of like making fun of ourselves, but there's a certain truth there too. Standing all alone in the spotlight you tend to feel a bit naked. Dreams was written mainly by Ken though I helped him out in the middle section. It was part of something else and we just took it out and added to it as we went along. In the dream sequence we bring in parts of different tunes from our other albums. It's difficult to ascertain exactly what any member adds to any song, really, because it all happens so quickly it's difficult to say who suggested what. I contribute most on the lyrics and some parts of the music. I Won't Mind for instance, we all got together on. It's slow and funky; it's nice because we'd never done anything like that before. On Suicidal Man on the other hand, I wrote the words when the music gave that feeling of a man barely hanging onto a bad situation by his fingertips. The last album was a bit rushed. On this one, though, the band had more time to settle down and listen to the songs. We'd record a number, take a week off from it, and then work on it again after giving it a fresh listen. Easy Road for instance, sounded so nice we decided to add orchestra to it. There was more time to be critical, you see, we are able to reject songs we'd done. It's the first time we've ever really had a choice of which songs we'd put on the album. Sure, we're pleased with it. We think it's the best cross section of songs we've release on any album." "The fact that we would produced ourselves was because of bad sales of Return to Fantasy in the USA. With High & Mighty we wanted to go in a new direction. The problem was we used just one source and we had just little time to be in the studio because of the extensive touring. We decided to put all Ken's songs on the album and hoped it worked out the right way. I think though we should have used everyone's songwriting. That's why High & Mighty is a bummer to me; for example Mick Box played just a few parts on the album."